If I'm sailing at a close reach can I use the jib block on the windward side to tension the jib? You should only use the lee side cleat for the jib. Pulling on the weather side will hook the clew to weather causing a wind flow disruption. If the jib seems to be too loose, you can do some other things. These adjustments move the sheeting angle: Move the car forward or aft... if the back edge is loose... move the car a little forward. This pulls more down on the back edge / leech. If the bottom is loose... move the car aft. What matt said. tensioning the lazy jib sheet (the one coming from the windward block) will only cause you to backwind the mainsail, disturbing the flow over the sail, pinching off the slot and leeching your speed. Your best option is to move the jib block/fairlead as Matt suggested. 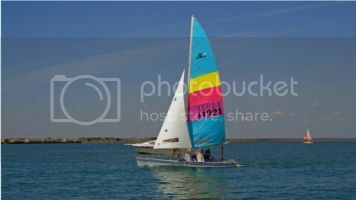 If your jib seems to flutter no matter what you do with the sheet tension and fairlead, the jib is probably blown out (past its useful life) and ought to be replaced. The only exception to "only using the lee side cleat for the jib" would be if you need to go hove-to. This is a very useful technique to know if you ever need to "park" your boat. Release the mainsheet and traveler, push and hold the tiller all the way to leeward, and pull the jib in hard on the windward side. The boat will remain in a very stable position and slowly claw its way forward, even in very strong winds. Otherwise, I agree with the others. Never sheet in the jib using the windward sheet/blocks while under way.